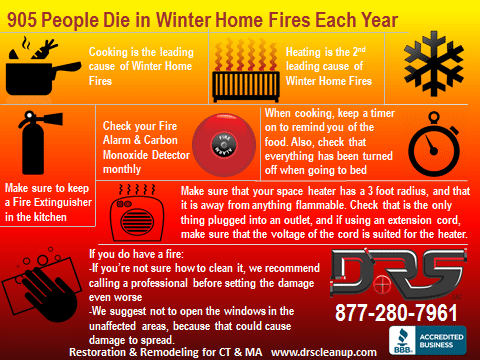 How to Avoid a Winter Fire this Year - Disaster Restoration Services, LLC. According to the U.S. Fire Administration, 905 people die in winter home fires every year with cooking being the leading cause and heating being the second leading cause. Here are some helpful tips to avoid a deadly fire within your home. -Make sure that all heating elements are placed away from anything flammable. Make sure that you and your family are prepared with a plan in case a fire does happen, to ensure that everyone gets out safely. Remember, lives are more important than anything that is inside that home. If you do experience a fire, and need help restoring your home, call DRS at 877-280-7961.